Lorrine “Lori” McIlwaine (nee Visci), 79, of Elyria Township, died Sunday August 12, 2018 at Mercy New Life Hospice Center of St. Joseph in Lorain after a short illness. She was born July 5, 1939 in Lorain and had resided in Elyria Township since 1961 moving from Lorain. 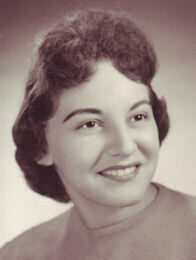 Lori graduated from Lorain High School with the class of 1957 A. She worked as a Key Punch Operator at US Steel in Lorain, then for Elyria City schools in the school library and cafeteria and then at EST Bank in Elyria where she worked as a teller and head teller retiring in 1994. Lori was a member of St. Agnes Catholic Church in Elyria and Eagles Lodge #435 in Elyria. She enjoyed spending time with her grandchildren, reading and watching Hallmark channel movies. She is survived by her husband of 57 years Robert J. “Bob” McIlwaine Sr, son Robert J. (Yanira) McIlwaine Jr of Alexandria, Virginia, daughter Lee Salas of Avon Lake; grandchildren: Kevin, Katelyn and Caroline McIlwaine, Trent Smith, Joey and Christopher DeWitt and Gillian, Joey and Zachary Salas; 2 great grandchildren; sister Anita Spacek (Joseph) of North Royalton and many nieces and nephews. She was preceded in death by her daughter Kimberly DeWitt, parents Carl Visci Sr & Catherine Visci (nee Brelich) and brother Carl Visci Jr. The family will receive friends Wednesday August 15th from 4:00-8:00 pm at the Gluvna-Shimo-Hromada Funeral Chapel, 3224 Broadway Ave, Lorain. Funeral services will be held Thursday August 16th at 10:30 am in the funeral chapel. The Rev. Albert Veigas, pastor of St Agnes Catholic Church in Elyria, will preside. Burial will follow in Ridge Hill Memorial Park in Amherst Twp. St. Jude Children’s Hospital, 262 Danny Thomas Place, Memphis, TN 38105.